Well drained soil is a must so, in heavy soil mix in some sand. Hyacinths like to live in lots of sun but light shade will make their flowers last longer. The larger the bulb, the more florets it will produce (60-70) although the flower stalks may become top-heavy and fall over, making the medium sized bulbs more suitable for garden planting. Flower clusters will become slightly smaller in subsequent flowering seasons. If you do leave them in the ground make sure that the plants are left to wither back completely. To hide the browning foliage interplant with annuals. PLANTING IN POTS AND CONTAINERS: As a container plant, Hyacinths are perfect because they seldom grow taller than 12" (30 cm). Your container should be at least 12" (30 cm) deep (to allow for proper planting depth and safeguard their development) and have sufficient drainage holes in the bottom (or near the bottom on the sides). Add clay granules or pot shards in the bottom to improve drainage then add ordinary potting soil mixed with 1/3 sharp sand or light garden soil. Fill the container up to about 6'' (15 cm) below the rim, arrange the bulbs so that they almost touch each other (for massive color effect), press the bulbs carefully into the soil (pointed ends up) and add soil up to 1/2" (1 cm) below the rim. Don't forget to add water during dry spells when temperatures are above freezing. 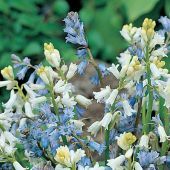 You can plant Winter pansies, forget-me-nots or ornamental cabbage on top of the hyacinths to keep the containers more attractive for a longer time. 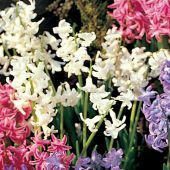 (When the frost has killed off those plants or as the hyacinths start to emerge, trim those over-plantings back, do not pull them out as this could damage the bulbs). 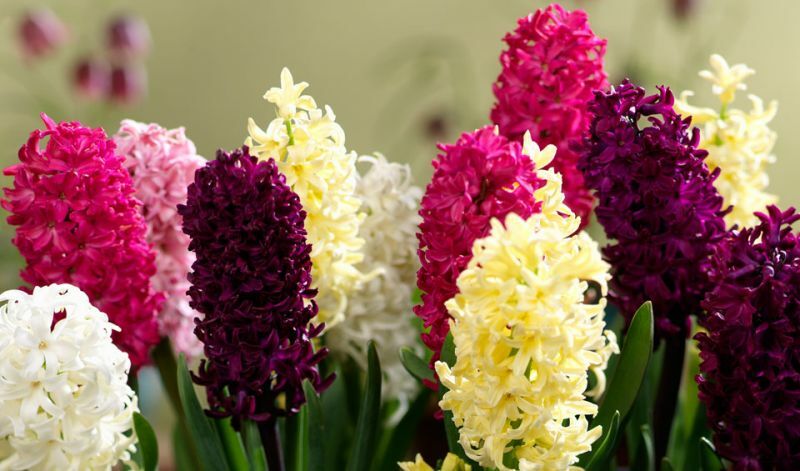 Hyacinths can suffer damage from extremely low temperatures when the cold penetrates the containers from all sides. So if you expect a really hard freeze find a temporary site where the frost will not set in. You can also wrap containers in plastic bubble-wrap if they are too big to move or if you do not have a frost-free space. Cover the soil in any case with straw, reeds or leaves. 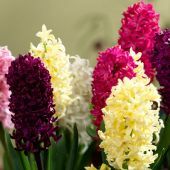 Of course you can also add some tulips or daffodils instead of filling the container totally with hyacinths alone: this will extend the flowering time by quite a bit as well you will have more choices of color combinations to choose from.